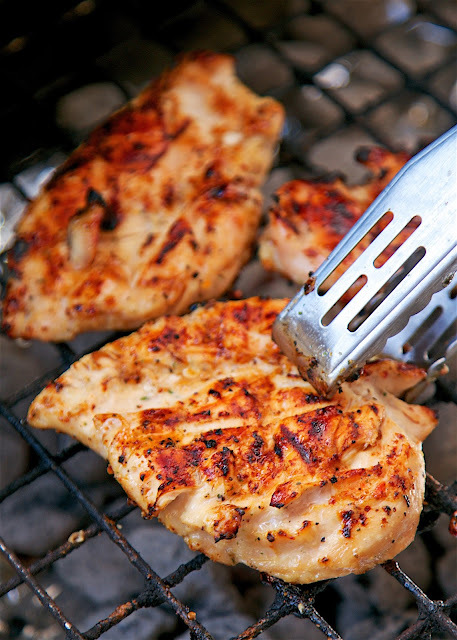 Honey Orange Grilled Chicken - only 4 ingredients! Orange juice, honey, Italian dressing mix and chicken. Marinate for an hour and grill. SO easy and super delicious! We doubled the recipe and ate leftovers the next day. Crazy good! For Christmas my friend, Robin, gave me a great cookbook. It was a collection of recipes from a bakery owner in Munford, AL. Robin grew up eating food from Miss Evelyn's and loves everything she makes. Miss Evelyn's family decided to collect her recipes and make a cookbook. I am so glad they did! Chicken Legs and I have been working our way through the cookbook and have loved everything we've made. 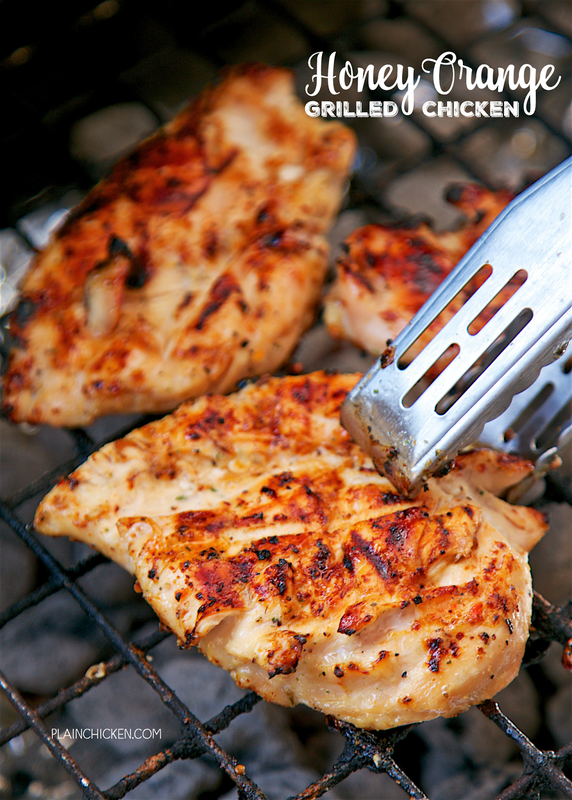 This recipe for Honey Orange Grilled Chicken is from Miss Evelyn's book. It is crazy simple and tastes amazing! Honey, orange juice and Italian dressing mix. I love using packets of Italian dressing mix - it adds tons of flavor! We let the chicken hang out for a few hours in the fridge before firing up the grill. It smelled fantastic while it cooked and tasted even better. 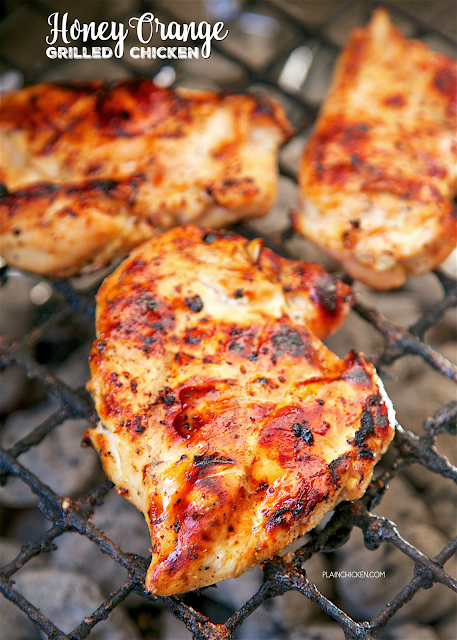 Love simple delicious grilling recipes! This recipe looks so tasty and fun. You made me NEED a copy of Miss Evelyn's cookbook. I don't suppose that is possible. My grandma's name was Evelyn and she was a great cook too. Oh, how I wish I had her recipes too. I am pretty sure they were all in her head and never written down. Thank you Stephanie for this post!!! I'm so glad you are getting good use of Mrs. Evelyn's cookbook!!! I tried this and it is absolutely delicious thanks Stephanie!! I liked this a lot! I want to try to make a salad with mandarin oranges and cranberries with this. Not sure what to do about the dressing. Can this be made in the oven? Thinking about making Honey Orange BROILED or BAKED Chicken Kabobs. :-) for the hubsters birthday celebration. Could this be made with liquid Italian dressing?